In Pakistan, private sector leaders have traditionally been largely reluctant to discuss one of the foremost impediments to the country’s economic growth – corruption. In both the press and the popular perception, the problem has typically been discussed as a product of a too-cozy nexus between the political and business elites. Meanwhile, representatives of the business community have considered the topic taboo, and as a result, have rarely conveyed their view – that in fact, by and large, far from benefiting, most in Pakistan’s private sector suffer from the high level of corruption. Since CIPE opened its Pakistan office in 2006 and began worked with the country’s chambers of commerce, it has gradually become more feasible to raise the issue of economic policy reform, and now for the first time, this has shifted to an open discussion of corruption. Business leaders now are willing to stand up and not only talk about the costs they face because of corruption, but to begin to think about how they can be part of the solution. On October 25 in Islamabad, CIPE and the Islamabad Chamber of Commerce and Industry (ICCI) organized a roundtable on “The Role of the Private Sector in Reducing Corruption,” the first meeting of its kind in Pakistan. The event featured a panel discussion among Mohammad Ali, Chair of the Securities and Exchange Commission of Pakistan (SECP); Zafar Bakhtawari, President of ICCI; Olaf Kellerhoff, Resident Representative of the Friedrich-Naumann Foundation; and top CIPE staff. More than 75 representatives of the private sector, government agencies including the Competition Commission and the Economic Reform Unit of the Ministry of Finance, representatives of think tanks, the IFC and World Bank, and the board and staff of ICCI attended. The event also highlighted another new initiative in Pakistan – a corruption perceptions survey of young entrepreneurs called “Unpacking Corruption,” conducted by the Young Entrepreneurs’ Forum of ICCI. The participants analyzed various aspects of the corruption issue in Pakistan. As CIPE Pakistan Country Director Moin Fudda pointed out, corruption is closely tied with a tremendous amount of waste in the country’s state-owned enterprises, which lose the equivalent of over $3 billion annually. To help address this problem, CIPE is working on a program with the SECP to improve corporate governance in such companies. Fudda also stressed that chambers and associations must become more aggressive in pushing back on corruption and engaging with parliamentarians to push for reforms, leveraging the power of the media. This is part of the reason for this new initiative with ICCI’s Young Entrepreneurs’ Forum; the publication will now be translated into Urdu and distributed across the country. ICCI President Bakhtawari spelled out some of the costs of corruption, including unemployment, low levels of domestic and foreign direct investment, and threats to the country’s stability. He pointed to the discretionary powers of law enforcement, civil administration and tax collection as chief among the sources of corruption. He further called for the privatization of a range of state-owned enterprises. SECP Chair Ali discussed a range of initiatives that he has championed from the government and policy sides to lessen the burden of corruption, including introducing e-filing of documents, faster registration of companies to encourage informal firms to formalize, revisions to the Code of Corporate Governance to strengthen audit procedures and separate the roles of Chairman and CEO, and reforming capital markets so that firms can borrow more easily from banks rather than through personal relationships. He noted a number of issues where more work is needed, for example in raising public sector salaries for lower-level bureaucrats, privatization of state-owned enterprises, revisions in the tax code, and, overall, improving enforcement of these laws and regulations. Ali also acknowledged the balancing act that regulators face between ensuring greater transparency and effective regulation on the one hand, and encouraging growth on the other through careful calibration of this regulation. Therefore, he emphasized the need for better “in-house” accountability within firms, through a stronger culture of ethics, governance and corporate citizenship in companies, pushed at the board level. 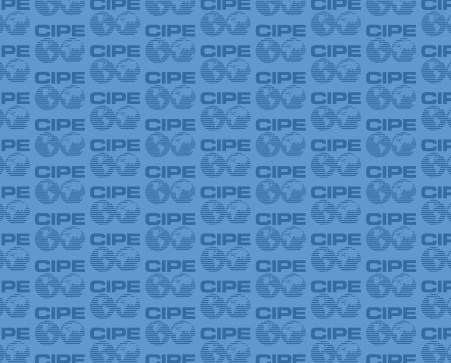 CIPE Regional Director for Eurasia and South Asia Andrew Wilson discussed a variety of private sector-led approaches that chambers and associations around the world have employed to tackle the corruption issue. These include, among others, the review of draft laws for their corruption potential in Russia; pushing for e-filing of corporate taxes in Armenia; in Colombia, integrity pacts on procurement, and in Bulgaria, building anticorruption coalitions between business groups and NGOs. Wilson noted that the private sector is increasingly active in resisting corruption for a range of reasons, linked mainly to the globalization of business. Countries need to increase competitiveness and efficiency, which means lowering the costs that arise from corruption. Similarly, firms face greater pressure to compete on cost, so the burden of corrupt payments and the time wasted by managers managing complex, unwritten relationships with bureaucrats is harder to overlook. Finally, multinationals with operations in the US or UK now face increasing compliance to comply with the US Foreign Corrupt Practices Act and the UK Anti-Bribery Act respectively, which means ensuring the integrity of local businesses all the way down their value chains, from suppliers and vendors to distributors. Picking up on these themes, Kellerhoff of the Friedrich-Naumann Foundation stressed the harm that corruption does to Pakistan’s economy. Much is made of the link between low investment levels and the country’s security situation. But as he noted, many companies do not invest in Pakistan because corruption adds 15-20 percent to the cost of doing business in the country. He further explained that corruption is not a problem that is somehow endemic or inevitable in countries such as Pakistan. He pointed out the importance of avoiding the “blame game” – that one country’s citizens are more corrupt than others. Corruption is a result of poorly written “rules of the economic game” in one country compared to others – and these rules can be changed to make economies function more transparently. After the panelists’ presentations, the participants engaged in a lively question-and-answer session that went past the scheduled time, due to the high level of interest. Among other issues, comments ranged from the link between corruption and business-to-business fraud; the need to build the capacity of government officials to effect regulation, through training and education; and the “virtuous cycle” effect that lowering corruption will have – as the economy begins to grow, and companies generate wealth, they will demand even more improvements in governance. This discussion was widely followed on Twitter, and the event also generated coverage in leading Pakistani newspapers, Dawn, the Daily Times, the Nation and Online News. The participants agreed that there will be no silver bullet to dealing with corruption in Pakistan, and that the process will take time and concerted effort. But it hoped that with the private sector increasingly coming on board, and discussing policy advocacy efforts to address the underlying causes of corruption, the country could be getting on the right path. Anticipating historic elections planned for 2013, Pakistan’s business community is ready to start asking difficult questions of policymakers and political parties, and demanding reforms that will curb corruption and spur growth.